I should start off by saying I am a laundry fanatic. I could easily see me in one of those Gain commercials smelling the bottle from some other patron’s cart…ok maybe not to that extreme. But I do find that I am obsessed with clothes smelling and looking clean. I know all laundry detergents clean but not all leave laundry looking and smelling clean! I am all over the Oxi-Clean and scented fabric softener. However, I hate sorting and too many loads so I am equally all about the Shout Color Catcher. That said I was standing in my local Vons staring at the latest Oxi-Clean – Oxi-Clean White. As I had said in my post on 99 Cent Store Steals, the generic oxygen cleaning agent seems to boost my laundry detergent the same as Oxi-Clean just not nearly as costly. But one of my personal frustrations as a mom is the ding left behind on whites like socks, sheets and shirts by boys…and maybe an occasional mascara smear by, um, me. Not even Oxi-Clean seems to get them as bright and white as I want and I’m not a fan of bleach and colors on whites. So as I said, I was staring at the new Oxi-Clean thinking maybe just maybe this would be an answer to my prayers when a blue box with big bold letters caught my eye. What can I say, I’m easily distracted by glitz and glam. 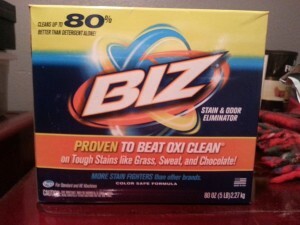 There it was in glorious writing, “BIZ: Proven to beat Oxi-Clean on tough stains like grass, sweat, and chocolate!” Sweat, I have sweat, what mother of a teenage boy doesn’t have sweat. I have grass…and fish guts…from their fishing and the occasional chocolate spluge from chocolate syrup mishaps. But I had never tried it and wasn’t familiar with it. And frankly, it was not one of those impulse purchases that don’t cost a lot so you buy them and toss them if they don’t work. But I did give in to the advertising on the box. And what can I say, there was truth in advertising. It lives up to what the box claims. Feel free to check out their site at BizStainFighter, but here’s my take on it. The first thing I noticed that I liked was the price. It was not a $1 but it wasn’t too much of a difference in cost per ounce to the generic I bought at the 99 Cent Store. And it was definitely less expensive than my beloved Oxi-Clean for about the same size…about $4 less. The second thing I noticed was when I got home and opened the box was the aroma. The mixture of citrus was pleasing and powerful without being overwhelming. A definite plus in my book. While I don’t know the science behind the enzymes that are listed as included, I personally found that the pleasing aroma lasted through my laundry even as a scoop in additive and I was pleased with the boosting power it gave to my laundry. I do prefer the tubs that Oxi-Clean comes in for the added security of not being worried about dumping the whole box on the floor and having it spill everywhere. The Biz has just a tear side and no closure so that may be a problem for those of us who tend to go through life with their shoelaces tied together. However, I addressed this by pouring it into an apothecary jar I use for my oxygen agents. Problem solved. The ultimate test was to be the whites. I did a test run on my husband’s and my sheets. Ok maybe TMI but my husband has a really oily face and his pillow cases show it. Despite multiple washes, I have never been able to completely get rid of that ding on his cases. Also, our sheets had a nice blue tint on my side of the bed. Sadly, a very comfortable pair of jeans that had excessive dye left the reminder of the time I fell asleep in them on the bed. Time to see if the “cleans up to 80% better than detergent alone” and “better than Oxi-Clean” stood true. While my sheets were not as white as I would like…you know the blinding bling white as seen in the Orbitz gum commercials…, I was duly impressed with the results. The oil ding was gone form my husband’s pillow cases. In fact, I can’t tell which is which any longer. The blue from the overnight sleep in jeans incident is still mildly visible but not nearly to the level it was after previous laundry soaking. Its more a faint hint of blue now, very tolerable and hardly noticeable. Overall, I would recommend BIZ to any mother, especially one of an active teenage boy. **Disclaimer: I am not compensated in any manner for this review and am in no way affiliated with BIZ or its producers, Oxi-Clean or its producers or any company mentioned in the above review. I’m just one mom sharing my personal experiences with others. You may or may not get the same results or feel the same as I do regarding any of the products mentioned in the above review. Definitely will give it a try on my used-to-be white T-shirts. Thanks for the tip.